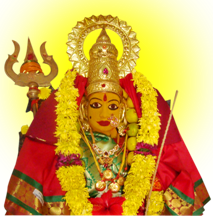 Sharada Navarathri is performed for nine days in which God is worshiped in the form of Mother. During this period, Durga, Lakshmi and Saraswati are worshipped as three different manifestations of Shakti or Cosmic energy, every day Chathushasti (64) Upachara pooja is performed with the respective homas, Sapthasathi paarayanam is conducted towards the end of the navarathri pooja and concluded with Anna Daanam. Significance of performing Sharada Navarathri Pooja? Every day there are two time periods that are ideal for upasana (spiritual practice), first being Bramhi Kaalam (early morning between 4 - 5 Am, just before sunrise) and second is Pradosha Kaalam (evening 5 - 6 Pm, just before sunset). During these time periods the mind can be put under control easily, during other times of the day, we are under the control of our minds :-). 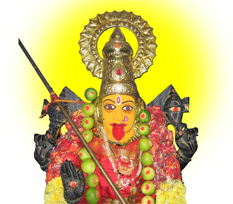 The significance of performing Sharada Navaratri pooja is that during these nine days unlike the other days in the year, the mind can be easily put under control through out the day. How is this possible ? 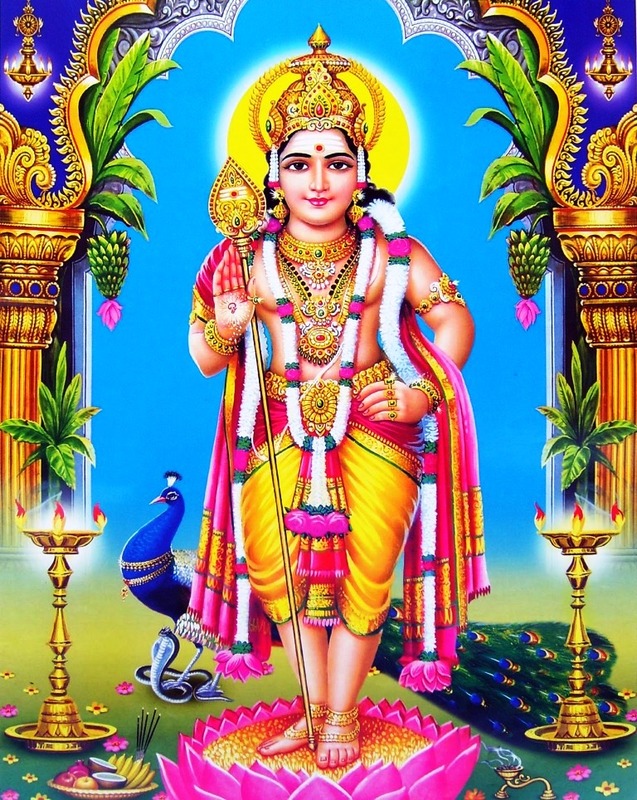 If you consider one month in a year as an hour of a day then the month when Dusshera is performed would fall under Bramhi Kaalam of that day. By performing the pooja during those days, Goddess Sharada will help us control our mind and in turn control our Ego & Pride. As part of Hemadurga temples 6th anniversary (shashtama vaarshikotshvam) we are performing various poojas and havanams like Ganapathi Upanishad Havanamu, Lakshmi Ganapathi Havanamu, Rudra and Chandi Havanamu. This year we are perfoming the prathista of Valli and Devasena near Subrhamnya swami. Kumbhabhishekam is a milestone in the lifetime of any Hindu Temple, it is believed to homogenize, synergize and enhances the mystic powers of the deity. Kumbha means the Head and denotes the Shikhara or Crown of the Temple (usually in the Gopuram) and Abhishekam is ritual bathing, (hence the term Kumbha + Abhishekam). This important activity has been prescribed by the Agama Sastras to be conducted every tweleve years. Observance of and participation in a Kumbhabhishekam have been equated with visiting and worshiping at a Temple for several hundred years. The energies of the installed Dieties are temporarily transferred to the main Kalashas in an elaborate ritual. Pujas and Homas are performed to sanctify the holy water in the Kalashas representing the invocation of the energy and the renewal of the energy contained within. Divine Power is transferred back to the deities by performing an abhishekam (salutary bathing) to the Vigrahas and Vimanas (pinnacles) on the roof with the sanctified holy waters from the kalasas accompanied by Vedic chanting and special rites. On that day at the designated auspicious time, when the Kumbha is bathed with the charged and sanctified holy waters contained in the sacrificial pots, consecrated and sanctified pranic powers trickle down a silver wire and enter the Deity installed inside the Sanctum Sanctorum of the Temple. This grand ceremony is being performed for the first time in this temple since the inception, this completes the tranformation of temple giving its dieties full power to protect dharma. 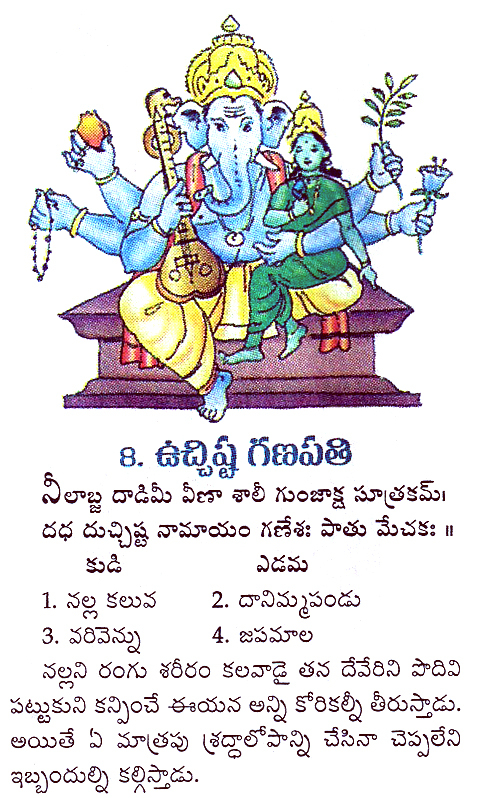 Sahasra Linga, Gayathri, Uchista Ganapathi & Subrahmanya Swami Prathista. For the third anniversary between June 13 - 15, we are performing the prathista of Sahasra Linga, Goddess Gayathri , Uchista Ganapathi & Subrahmanya swami. Gayathri Devi symbolises the "shakti" (strength) and "dev" (quality) of Knowledge, Purity and Virtue. Gayatri Devi is believed to have given the four Vedas to mankind. 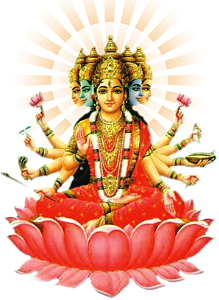 Gayatri is depicted seated on a lotus. She is depicted with five faces representing the pancha pranas /pancha vayus(five lives/winds): prana, apana,vyana, udana, samana, of the five principles/ elements (pancha tatwas) earth, water, air, fire, sky (prithvi, jala, vayu, teja, aakasha). 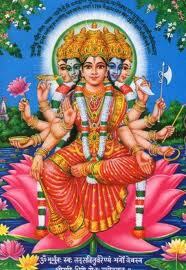 She has 10 hands carrying the five ayudhas: shankha; chakra, kamala, varada, abhaya, kasha, ankusha, ujjwala utensil, rudrakshi mala. Gayatri mantra is meant for realization of God and is regarded as representing the Supreme Lord. It is meant for spiritually advanced people. Success in chanting it enables one to enter the transcendental position of the Lord. But, in order to chant the Gayatri mantra, it is necessary for one to first acquire the qualities of the perfectly balanced person in terms of the qualities of goodness according to the laws of material nature. Dadahduchishta namamya ganeshah paadu mechakah! 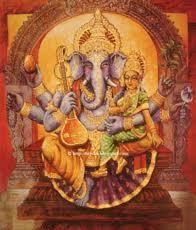 Ucchishta Ganapati depicted in deep blue color. He has six hands and holds a pomegranate fruit, veena, flower, paddy, Rudraksha mala and noose. A Goddess sits on his left lap. The popular belief is that propitiating this form Ganesha will help in control of the five senses and which in return will help in attaining peace and prosperity.